Among a few requirements demanded by NCHE for KUMU to acquire a chatter, is a standard library with a nought space, well stocked with resent Text Books, E-Library system and enough qualified library staff. Since Kumi University has 1,000 students, it shall be 2,000m2(good level) or 1,000 m2 (acceptable), this implies that there is a need of at least 1,000m2 to meet NCHE’s requirement. The answer to this questions is right here at hand, the construction of a two story library block is commencing in May this year after the design the design in complete and the ground floor of the same is expected be complete late October before the 15th Graduation Ceremony and 20th Anniversary in November this very year. Besides This said block will house E-learning Center. “Immediately after the completion of the library, we are going to continue the construction of the administrative block of the University which will be the first floor of the library building”, said Jecob Kim(acting DVC F&A). The University Library will need other equipment such as text books, E-books, E-journals, shelves, tables, chairs, Computers and internet. The university intends to do this effectively and efficiently as soon as posible. The budget for main building would be 1,000 m2 x 750,000(construction cost per m2) =750M Ug shs (250M KRW) for building construction only. Before the construction kicks off, 50% of total budget shall be in cash and continue to raise funds during the construction process. There will be a variety of fund raising sources mostly coming from Korean friends such as LCI (Loving Concern International), Erom Company, Church connections of Korean lecturers, etc. The University expects donations from alumni of Kumi University. 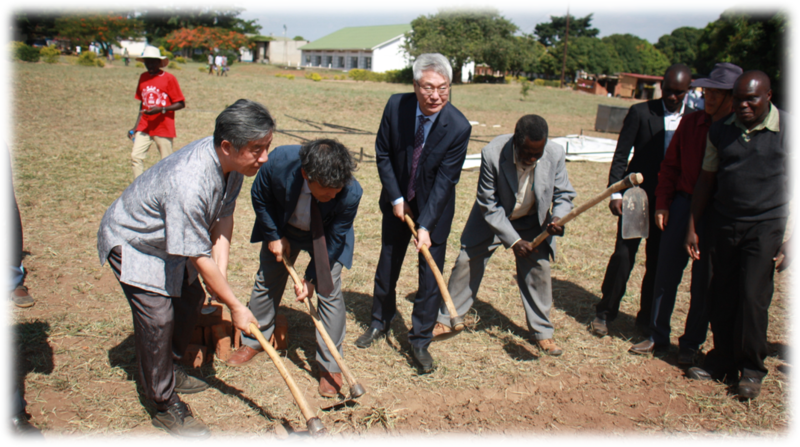 The chancellor of Kumi University, Dr. Hwang and the Chairperson of Kumi University Board of trustee as well as Chairperson of Loving Concern International attended the ground breaking ceremony which was held where the library is going to be constructed. The design of library is be done by Prof, Hwang, a renowned designer for Everland construction. 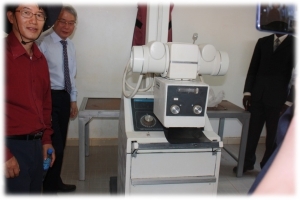 After the ground breaking of the new library and main admin block, the ceremony continued where the X-ray machine was officially handed over to Kumi University Clinic by erom company. We believe the machine provide great contribution in treating the community around Kumi University and Ugandans at large. Dr. Hwang and Loving Concern International (LCI) Chairperson came with the initial seed money of U$10,000 which was promised to Kumi University for the next 10 years on a monthly basis, this money will be committed to the development programs of the university only.